Hello Design Families! 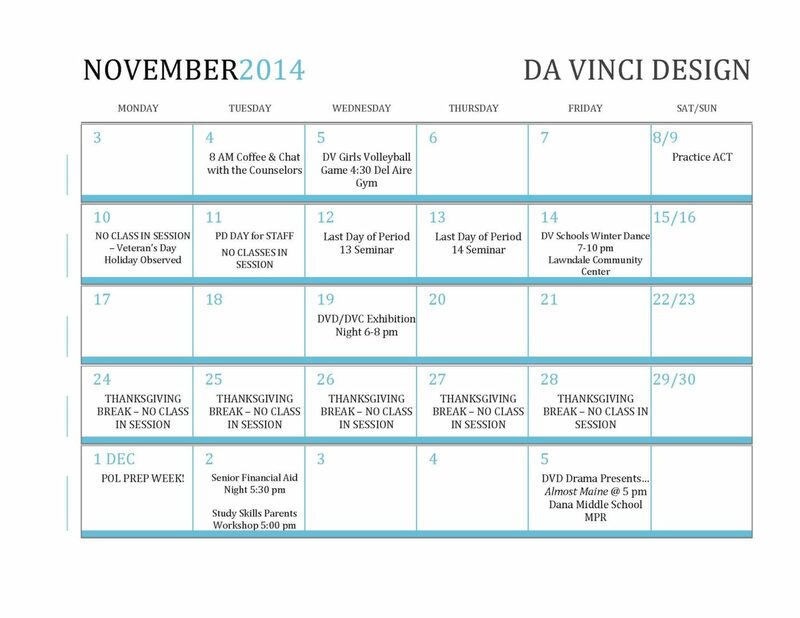 Below is your November at a Glance calendar (with a bonus first week of December). Pre-sale ticket sales have ended, but you can still buy a ticket at the door for $3! Dia de los Muertos face painting will be available in the morning, at lunch and at the fiesta with prices ranging from $2-$5. There will be a pinata, games, and fiesta music! There is also a Black & White Dance for ALL DA VINCI SCHOOLS from 7-10 pm on Friday, November 14th at the Lawndale Community Center. Tickets will be on sale starting tomorrow (10/30) at lunch for $15. Students can come to a haunted house and participate in a few fall activities! There will be snacks and drinks for purchase, as well as festive flower crowns! Music, fun, games and more! Tickets can still be purchased at the door! Parents/Guardians: If your student is attending tonight’s event Fright Night Out, doors will open at 6:00 pm. The event will END at 8:00 pm. Students cannot leave the event before 8:00 pm without a parent physically coming onto campus to get them. Pick up from the school event should be no later than 8:30 pm. Please call the school with any further questions. Thank you! 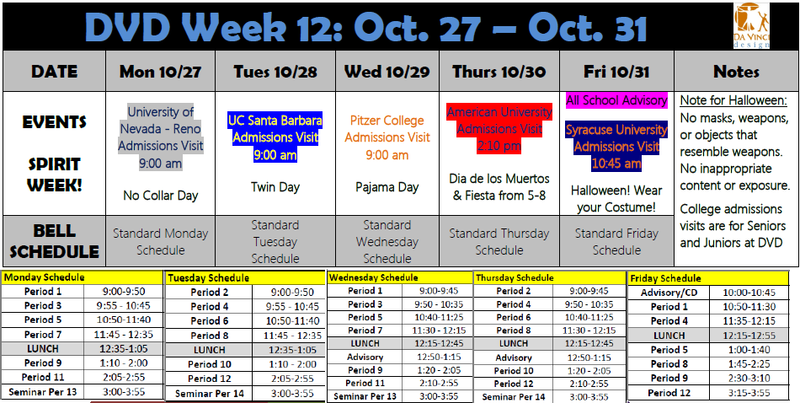 Week 12 Update – Spirit Week & Halloween! Hello Design families! Below is your Week 12 update. 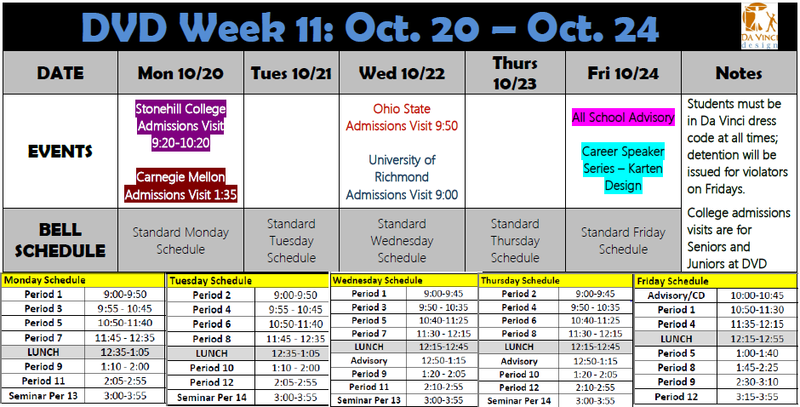 There are lots of college admissions visits and fun theme days! Show your DV spirit this week. On Friday there will be a Halloween Costume contest! Have a great weekend! Old Navy – Paid Work Opportunity for DV students! Old Navy in Manhattan Beach wants to hire Da Vinci students for paid positions over the holidays. To learn more about it, plan to attend an Information Session this Friday, October 24th at 9:00 a.m. in the Fab Lab. An Old Navy recruiter will be there to explain how to apply. Applicants must be 16 years of age. This is a great opportunity to have real work experience and to work with a great management team! Students: See information below regarding basketball and soccer team sign-ups. Contact Coach Curry at tcurry@davincischools.org with any questions! Hello Designers! 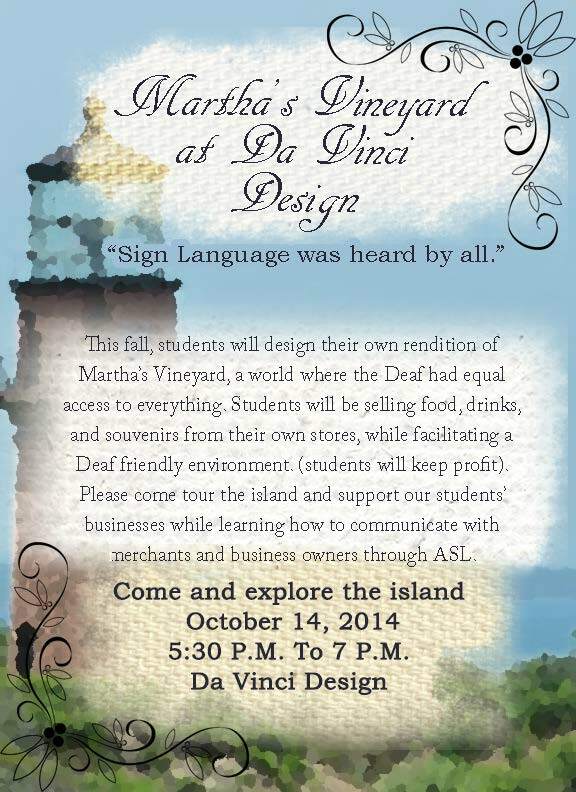 Thank you for supporting ASL’s Martha’s Vineyard Exhibition and our Hispanic Heritage Month Celebration this week! Excellent work was done by all staff and students involved. Below is your Week 11 Update. Have a wonderful weekend! Hello Design families! We wanted to send a few reminders about this week’s events. See below! Come see, hear and learn about various cultures and countries! There will be food, music, dancing and many booths to learn from!